Aza told me in no uncertain terms that I "need" to post an update on how I’m doing. He pointed out that the last update was in February. I apologise. I’ve been so focussed on launching the book, I should have updated much earlier. 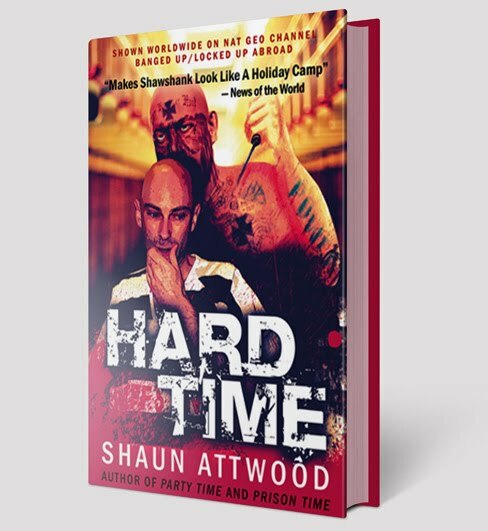 Since Hard Time was published on August 5th, my life has revolved around its Amazon ranking number. (If you are inclined to waste your life away watching it with me, scroll down the Amazon page to "Product Details" and then "Amazon Bestsellers Rank") It made a strong debut. On the back of the BBC and Guardian news stories it got as high as 600, out of 1 million plus books. Nowhere near Tony Blair though, who was number 1 last week. As I write, Hard Time is at 10,140. The number goes up and down like the stock market. At first, I was jumping out of bed at dawn, starting my computer, and gazing impatiently at the screen to get the number, like a heroin addict fiending for the first fix of the day. Fortunately, some concerned friends performed an intervention. I was told that obsessing on the number would lead to a mental breakdown. Thanks to them, I’m down to looking at it about 5 times a day from about 50. I'm suffering withdrawal symptoms though. Even writing this is generating the urge to click over to Amazon. Damn! It’s at 13,823 now. A big thank you to all of you who’ve read Hard Time and posted customer reviews at Amazon – including Aza. Reviewers are generally saying that they can't put the book down in order to find out what happens to me next. I’m also getting different feedback from women and men. Men focussing on the mayhem, women saying they like the love theme with Claudia. After Sheriff Joe Arpaio announced that he was reading Hard Time, I got several media inquiries out of America. Here's the Phoenix New Times story with its 106 comments, including plenty of Arpaio supporters slamming me. Arpaio approved Hard Time for the Maricopa County jail library, so I donated three copies for the inmates. I’m curious as to whether Arpaio will comment on the book. 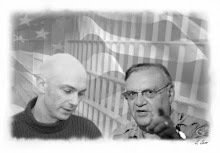 A few readers have suggested I debate the jail conditions and his hard-line policies with Arpaio on TV. I’d be glad to do so if he’s willing to fly to England as I’m banned for life from America by the Department of Homeland Security. So far my three attempts to send Hard Time to prisoners in the Arizona Department of Corrections have been thwarted. No explanation has been given by the property officer for rejecting the book – an illegal violation of the civil rights of the prisoners concerned. The prison has also rejected some letters sent by readers of this blog to our friends inside, citing no reason for the rejections, which is also illegal. My publisher said that I should take things easier workwise now that Hard Time is published. But that’s just not in my nature. I’m frustrated that I've been too busy since the publication to get much writing in. The prequel to Hard Time is at 110,000 words, but I’ve only just begun to polish the first 50 pages. I’ve also been bouncing ideas off various people who are generously spending time proof-reading chunks of the prequel. Hopefully, it’ll be ready next year. I’d also like to get a collection of short stories out, and to include contributions by some of the prisoners who write for this blog. I did my first talk to a largish adult audience just a few days ago. About 80 people at True Stories Told Live. I was allowed to talk for 10 minutes only. Not easy for someone as verbose as me. I practiced plenty, and distilled the talk down to its punchiest elements. It was well received. The man who hosted the event, David Hepworth, watched me talk at Kingston Grammar School, and blogged about it here. The presentations to schools are going from strength to strength. I’ve refined the talk to include a display of prison clothes, and PowerPoint images. The latter has taken the talk to a whole new level. The spider-bite wound image gets the students every time. I only show it for five seconds, but it causes so much uproar that I’m basically just left standing there drinking water while the teachers calm the students down. Two boys recently fainted at one school where it was shown. I also got mobbed on a train to London by a group of sixth formers who’d heard my talk. Hard Time now has a US publisher, and is scheduled for general release in spring. The media stories have been building up. Two magazines, FHM and The Word, are next. The Hard Time literary event is coming up on October 21st at the Royal Festival Hall in London, the largest exhibition centre in the world. I’ll be getting interviewed by Erwin James the lifer turned journalist and author, who did Hard Time proud recently in The Guardian. Tickets are on sale here, with the proceeds going to the Koestler Trust, a charitable organisation that helps prisoners pursue arts. Tickets are only £5, and the event is almost sold out. Four people are flying from America, including some of my blog readers, and two from Ireland for this. On October 29th is the Hard Time hometown launch party at The 8 Towers pub in Widnes. If you live in the northwest of England you are welcome to attend this free event that will include a talk, PowerPoint images, book signing and two special guests from Hard Time: Wild Man and Hammy. Will you be there, Aza? Early indications suggest that several people from our school year at St. Josephs will be going, and quite a few from Fairfield. Gaaaaaaaah! What's the deal with the spider bite? Is that one of the tales on the site? It's actually one of the tales in Hard Time. I assist in the squeezing out of the pus as the jail refused to treat insect bites. Good to hear you're doing all right. I have just finished your (first) book, and it's an excellent read (I want the next one - now!). haha - I will buy a couple and give away for xmas. Hope that you one time find time to compile a collection of short stories and anecdotes - I bet you have some good ones in your drawer.